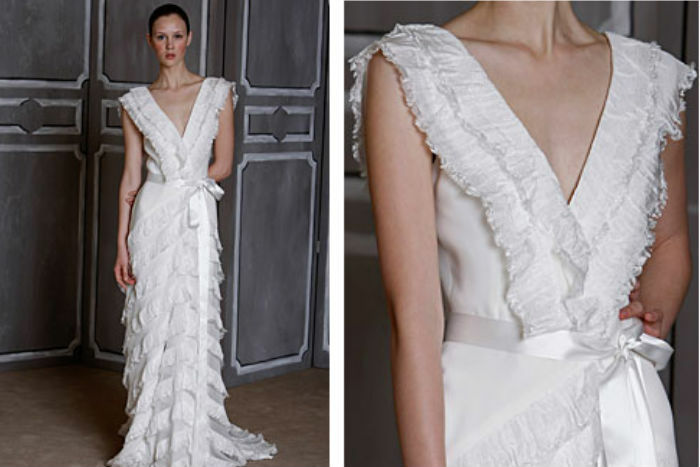 Graceful, grand, and distinctive are all words that come to mind when thinking of a Carolina Herrera wedding gown. These gowns, like the designer herself, are sweetly sophisticated, stylish and charming - the epitome of refinement. the ’80s and ’90s she was one of New York society’s preeminent designers, dressing Jacqueline Kennedy Onassis during the last twelve years of the former First Lady’s life. One part socialite, one part philanthropist, she is a savvy business woman who has built an empire based upon good taste and sense of style. Brides with refined and elegant sensibilities will embrace a Herrera gown. Embroidered bodices, georgette ruffles, and satin trims are important aspects to many of her designs–thoughtful touches to otherwise simple silhouettes. Less is more with her shapes and styles. Bustiers, empire waists, and lean silhouettes are all parts of her seasonal collections. She is known for impeccable tailoring with clean lines and sometimes sweeping ball skirts. Her gowns incorporate novelty fabrics and exquisite detailing, evident in her use of ruffles, pleats, and flowers. Her gowns are fresh, urban, and cosmopolitan, instantly making a bride feel worldly and sophisticated. Herrera finds inspiration in the most uncommon places. Whether it be the history of fashion through the ages or English tea roses in a garden, she integrates these details beautifully in an unassuming way. She works with a woman’s figure and allows her gowns to accentuate the female form. Her lady-like touches set her gowns apart. Classically chic and so refined, we are smitten! 2009 Collection and a few more.